– Even if you are frustrated and know you’re in the wrong job/profession, do your best. You need favorable references to change jobs, and you won’t get them if you’re not engaged or acting hostile to your coworkers. – Try to learn something new every day at your job. I’d watch Excel and web design videos for 5 to 20 minutes. Overtime, my skills improved and I was able to make a better case for myself for getting better projects at work. It also feels so much better to be doing “something” towards advancing yourself and your goals, than waiting for opportunities to come to you. Such good suggestions, Rachel! And I’m so glad to hear that you guys made the move! God Bless You and Your Words Sarah! I’ll somehow be making a post with links from around the web, and this will be the highlight, definitely something I needed to read this week. So glad you liked it, Katie! Hmmm. Very well done, Sarah. I think that for some of us, there is not going to be a “right job,” but just things that are right at that moment. It took me about 40 different jobs to learn that and settle for just-ok. I plan to some day move to a different job (still), but I now expect the new job to be just right for a period of time, and then just ok once the shiny wears off, and then to eventually trade it out, as well. For me, it’s important to differentiate what I *need* in a job from what I *want. * It’s easy to be attracted to what I want. It’s harder to remember to look for what I need first, and then pick what I want the most from what is left. Extra hard when some of the most important things (salary, benefits, etc) are almost never listed in job postings. For example: I want a job that lets me get outside and do a wide variety of things, but I NEED a job that provides a dependable income stream above a certain threshold and provides a reasonable work-life balance. This is so great, I know so many people who are struggling with this and I’ve been there, too! I just moved to Denver, CO this fall. I think it’s a great fit if you like a mix of urban + outdoor life, if you’re liberal (of course) and if you like the food + fitness culture. Young people are moving here in droves! The jobs are plenty, but the housing market is intense. I paid an ungodly amount for a home that, in other parts of the country, would probably cost $90k. It’s always important to consider the trade offs! Most importantly about Denver is the work/life balance and work culture. I work in a high rise downtown and wear jeans to work, and I’m getting paid a full salary to only be in the office 3 days a week. People take pleasure very seriously here and being happy at work and home is a top priority for most companies. Great insights into Denver, Jessica! I have lots of friends who live there and they looooove it! This post is SO SO great! I have had similar feelings lately so this post really speaks to me. It was also very nice to read that its okay to have a job that you don’t love but affords you the luxury of having time/money to pursue your hobbies/passions on the side. I have had a job for the past few years that I really don’t love. A few months ago I took another job that I ended up absolutely hating. I was lucky enough to have my other job take me back. I realized that while I am not super passionate about my other job, the amazing schedule I have at it really leaves me with a lot of time to pursue my passions and spend time with the people I love. I have learned work/life balance is definitely one of the most important things to me in a job. I have definitely felt like a sell-out and that I should be in a job I truly love, so it was so so great to read your advice/thoughts on it. I read your blog every day and love all your posts, but this is definitely one of my favorites! It is so refreshing to not just read “yay its so easy to work for yourself, just quit your job and it’ll happen!” but to actually get real life advice and thoughts on how to make it happen/how it can be a real struggle. I’m so glad you liked it, Callan. Working for yourself is awesome – for some people. But it’s also soooo much work and can totally take over your life. I’m glad to hear you were able to get your old job back! Thank you so, so much for this post. I’m quietly tearing up at my desk as we speak because the relevancy of this post to my life today and for the past few weeks could not be more on point. In the past year, I moved from some place I hated living in where I had zero friends to some place that I mostly like where I have only a few friends, so I’m already considering another move to the one place I know I love where I have lots of friends and family… except it feels like maybe I’m not trying hard enough or that leaving this job and city already wouldn’t be giving it all a fair chance and would end up feeling like I was “quitting.” And, as you often do, you put so much of this in perspective for me: thank you!! I really can’t say enough about how much I look forward to reading your posts, especially since you always seem to have some kind of ESP about what I need to hear exactly when I need to hear it! <3 Your comment made my day, VK! I love the section where you talk about having a job that’s fine and using it to fund the best parts of your life. Also the part where you don’t have to do the same thing forever. So important. If I may plug a book that I have not read yet (my to be read pile is embarrassing) but I know is great because EVERYONE is talking about it- Do Over by Jon Acuff. A dude who moved to Nashville for his dream job, had crazy success at said job, but realized “meh, not for me” and quit and then spent a year studying how people are tackling their dreams and declaring “DO OVER” to change careers, change their lives, accomplish goals that have been on the back burner. This seems like a great read for anyone but especially the Reno-hating woman 🙂 who wrote you the letter. one last thing I want to add. Most people have so many choices and are trying for the perfect one. Just pick. Just decide. Is it that easy? Nope, and I am simplifying things, and you should research, but at some point it’s just about deciding where you’re headed and then putting your energy in that direction. I was in a situation where I felt I had so many choices, I was sending out resumes to everything and few of the jobs had anything in common. As soon as I just decided “you know what, I want to be a dance teacher and I want to work in a high school, preferably an arts high school” my path was so much clearer. And I ended up getting hired EXACTLY where I wanted to be (now we’ll see if it’s half as good as I hope). It took a while to get there, and I don’t regret the year of job searching and odd jobs and part-time work, but I had so much anxiety over “am I going to pick the wrong thing” that was unnecessary, because as soon as I just picked SOMETHING (even if it had been some of the other choices I was toying with) I built momentum and moved forward really quickly. Yes! I agree. It’s ok to just pick *something. * It’s not a life sentence. You’ll never know whether or not it’s the right thing until you try it. And if you give it an honest, serious trial and it doesn’t work out, then you have learned something and it’s time to move on. Oooohhh! That book sounds amazing! I’ve been on the hunt for True Story interview subjects who are on their ‘second act’ – that stuff is so inspiring! Thank you so much Sarah! You have got no idea how much I needed to read this advice right now. I’m currently in a young person’s job where it’s split in the middle between two roles. One part is pretty cool and makes me sound like an interesting person at dinner parties. The other part doesn’t make me sound cool at dinner parties, but I’m extremely good at it and could go far if I found a job which focused on it exclusively. I’ve not decided what I’m doing yet but thank you for reminding me that I’m not a ‘sell-out’ for doing a job that is perceived as boring. And whatever I do decide I’ll try and remember these words. Such a timely post for me! I’m adding some of this great advice to my to do list. I’ve been feeling ‘meh’ about my job for a long time but lately it has become very frustrating and I’ve been casting about for ideas. It was convenient at the time but now I’ve been renting in my hometown for seven years and I have to admit I’ve been lazy and unintentional, and now I feel trapped! If I leave my job, I become financially insecure. If I move somewhere better in my area, it will be much more expensive and a longer commute. I can’t move the other end of the country and start afresh without leaving my partner behind. I feel like I’m running into a lot of catch 22s. I wonder if anyone has any ‘survive work’ tips for someone not in a desk job? I work in a hospital and my working hours and conditions are set in stone. There is no flexibility or opportunity to volunteer for something new. I’m trying to be open to advice but I’ve genuinely found it hard to apply stuff I’m reading to my career. Is your partner interested in moving? Do they work in a field that would make it easy for them to find another job? He would definitely move if I asked him to, but he has invested a lot of time and effort with his studio (making cartoons for a living is harder than you’d think, apparently 🙂 ) so it’s more of a last resort. Our original plan was to move to our nearest city (we live in a sort of commuter belt area) which would be a similar commuting distance for him and then I would work in the city but so far, no luck! The rental market in Ireland is pretty terrible so we were considering buying but we can’t get a mortgage without my secure job. And our backup plan is to move to the UK but that has some pitfalls as well. So we do have options but I think it’s a matter of finding the right compromise. And for me to stop stressing about ‘wasting’ all our money – cos what’s the point in having it if you don’t use it to make your life better, right? And while we’re waiting for the right opportunity I’m going to try some of your tips. Like checking out the tourist stuff in our area, that’s one thing I’ve been talking about for ages, time to give it a go! 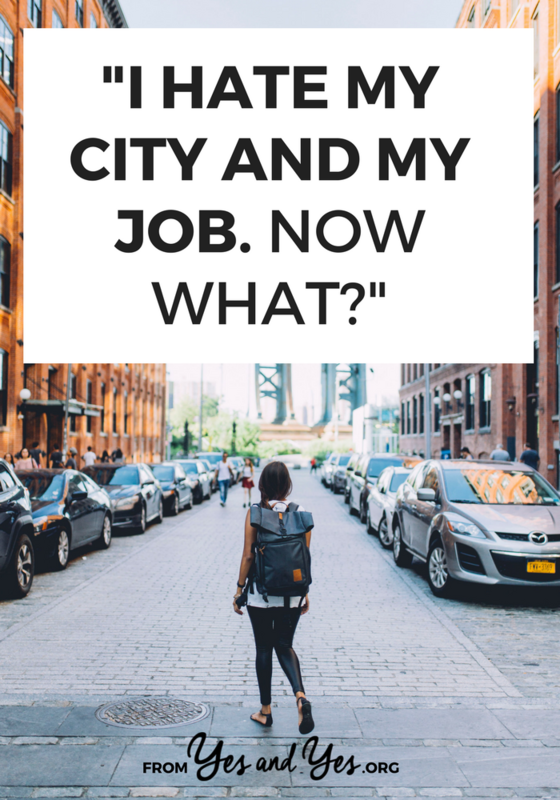 I just completed the move cities part and I am now attempting the career change part. Being patient with myself in the instant gratification world we live in is the hardest part. The best thing that’s helped me so far is to join ClassPass. I’ve started working out regularly and exploring new areas of the city with the different yoga and barre classes. Plus, those endorphins Elle Woods uses as her defense in Legally Blonde are real and they help balance out some [definitely not all!] of my anxieties that are popping up during the move + career soul searching. Oh, such a good idea! I looooooved my hip hop dance class! Excellent career advice! I’m a career counselor and would echo everything you said! Don’t forget to contact your undergrad and graduate schools’ career services. They have tons of helpful information and often times will meet with alumni for free (vs. a career coach which might be pricey). So glad we got it right – and great suggestions about using career services! So timely! I’m a couple years from finishing my PhD in a field I dreamed about as a kid and still really love, but as I get closer to graduating, I’m realizing that I don’t think academia is the right fit for me. Unfortunately there are no positions in the private sector in my field, so leaving academia would mean giving up on a childhood dream. But the working conditions (long periods by myself in my office, working on a problem very few other people care about) are a bad enough fit that I’m about ready to jump ship to something else entirely once I finish. It’s so hard to give up on a long-held dream, but I really appreciate the reminder that it’s ok to do just that. My partner was actually in the exact same situation five years ago (there’s not much work in corporate America for climatologists). He took a corporate job but kept adjuncting and taking weather-related contract work and now he was his dream job at the senior climatologist for the state of Minnesota. Which is not to say that you SHOULDN’T give up on the dream if that’s really what you want to do …. but finding your dream job is still possible! Yes! Yes! Yes! 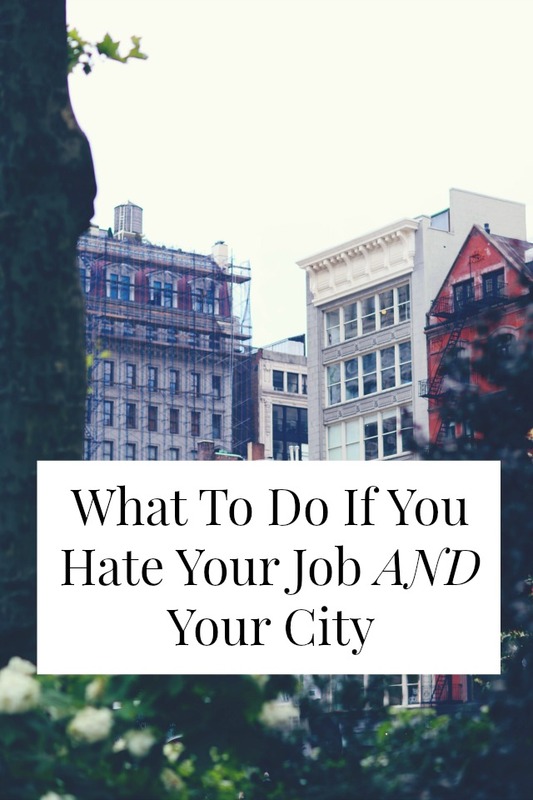 I happen to LOVE my city, but my job was causing so much stress and frustration and bitterness that it was hard to appreciate (or find energy or enthusiasm) for the life I’ve created here. Later this week, I’m moving about 1,000 miles from the upper Midwest to the Deep South, and after 7 years of high school teaching I’m leaving the classroom to do outreach/education for an environmental nonprofit. My partner also took a job down in the Gulf Coast, so I had opportunities to explore with him this winter. This post hit on so many important things- I would say that the most useful thing I did when I realized I was burning out on classroom teaching was start searching for interesting positions online and looking at the experience/qualifications that were listed. It helped me get my dream job because I’d spent a year taking a few classes on computer programs (Adobe suite stuff) that many education coordinator/manager positions wanted. I also took on some hours volunteering for an environmental nonprofit doing communications work, and it let me know that I DEFINITELY wanted to move into the outreach field and gave me some experience as well. It made my job search process and interview process incredibly easy, because I’d gotten to plan for some of the gaps in both skill and experience that I would have had otherwise. It also made my teaching job more bearable- because I was taking active steps to change my sense of being ‘stuck’. This is so awesome. I lived in Pittsburgh (my hometown) for three years after college… and everyday for at least the last 18 months wanted to jump off one of the 400+ bridges. Now I live in San Francisco and I am so happy!!! This was fantastic. Thank you for writing this – it’s really what I need in my life at the moment. I’m in a city that I don’t like, a job that is not really for me, and a degree that I really want to use but have been unable to find positions locally. After two years of job hunting in my city and the surrounding region, I feel stuck. The thing that’s keeping me here? I have the greatest friends I’ve ever met in my life. I’ve lived in a couple of different cities, but have never had a circle of friends that I’ve adored this much – all very wonderful, positive, supportive people. Mentally I know that we can still keep in touch due to the joys of the Internet and that I can always come visit/they can visit me, but I’m still struggling at the idea of moving away for that one reason. Any advice or words of wisdom? A year ago I moved to work to the North of Sweden and in several months I realized that I hated the place. Not Sweden as a state, but its Nordic climate and its ‘forever indoors’ life style. In winter the temperature can drop to as low as minus 25 C’ and there is barely any sunlight. What is more, the place where I moved is a small town (75.000 people) which is depressing for me who is used to living in a big city. Luckily, my work is flexible (I’m doing PhD and my main job is writing articles and reviews), so I spend most of my time in my home town. But during teaching periods I have to be here in the North and somehow cope with this ‘exotic’ environment. My advice is before moving anywhere, it is better to go there and stay at least for one month, preferably not a summer month when everything seems bright and lovely in the sun. If I am not mistaken, Sarah, you are originally from somewhere in Scandinavia, aren’t you? How did you cope with the (always bad) weather? I really need some philosophy to tolerate another three years before I move at least to the South of Sweden. I so needed to read this today. Thanks for the advice!! Just to remind you that a lot of famous people have made their first million at their 30s, 40s and so on years so don’t judge yourself too harshly! Keep moving forward and sooner or later you’ll succeed! Wish you all the best, Man With Van Collier Row Ltd. I know the feeling of itching to get out of your job and your town, and I know the feeling of arriving in the place you’ve been dreaming about into the job you’ve dreamed about. I’ve lived it for three years now and it’s been crazy and wonderful and challenging. You’ve hit some great points in this post, especially about even a different job having things that aren’t so fantastic about it. And also that if you make a change, you don’t have to do it forever. I have loved my time here and wouldn’t trade it for the world, but I’m looking into other adventures for 2016 in a different job and different place! I am just astonished how I came across your blog post while binge reading my favorite blog(unbrave girl) ! The timing could not be more perfect- I am in an anywhere but here phase of my life- my city has been voted 2nd worst cities of the world. All the friends I have made over last 25 years of my life have left this city so I have to make new friends anyway. And I started to have doubt about my dream career after giving birth to my little boy. I just want to spend a considerable amount of time with him. Your blog post has answered all of my dilemmas one by one. The pressure of choosing dream career and doing best in it is now off my shoulder. Having a balanced life is much more necessary. It is a wonder how we and our priority change over time. Thank you for this post Sarah! You’ve done it again! Straight communication to my heart and my brain. Thanks for the article. Lots of useful websites as well.